The 9th morning of the trek welcomed most of us in a fantastic way, with amazing skies and mountain vistas in every direction that left me dumbstruck. Unfortunately, Christen was laid up with some serious muscle spasms in her back that would leave her out of commission for the day. When your body speaks up on the trail, you have to listen to what it wants. During breakfast, Karma explained what we would be doing for our “rest” day. In truth, there was little rest to be had. 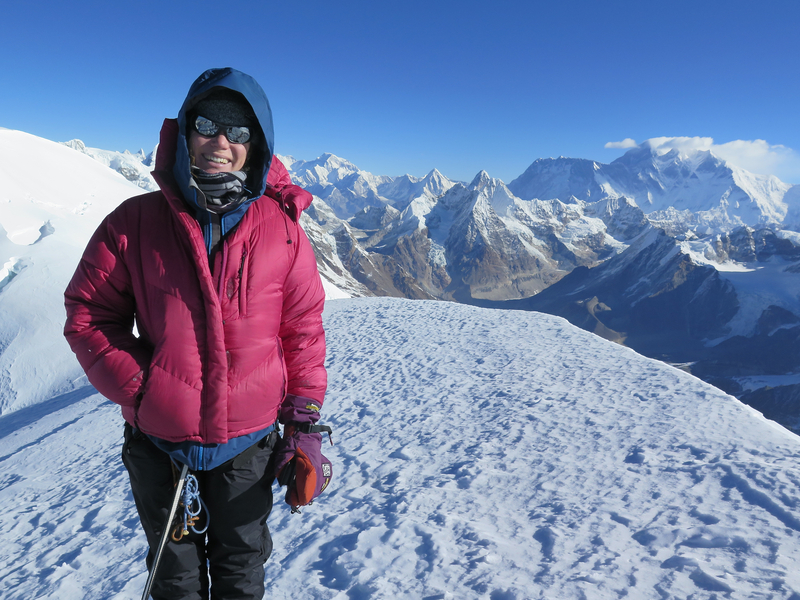 In order to help acclimatize to the growing altitude, we were to hike to the top of a nearby 5000 meter (16,500 ft) ridge, a gain of 2300 ft, and then come back down to Tagnak to spend the night again. Despite the effort and thinning air, it was like ascending into a hiker’s paradise. All around were 7000 meter peaks climbing straight up out of deep river valleys, scraped out by water over the years as both ice and liquid. Every direction I turned, my senses were assaulted by mind-boggling scenes of rock, ice, and sky. Rose and Ang Rita work their way up the trail. 7000 meter peaks tower over a valley with a deep glacial lake and moraine. Tagnak, our home for the night, is in the valley below the lake. Khare, our next destination, is further up the valley in the top right of the photo. As we continued up the winding and exposed trail, a low rumble thundered down the mountainside far up to our right. 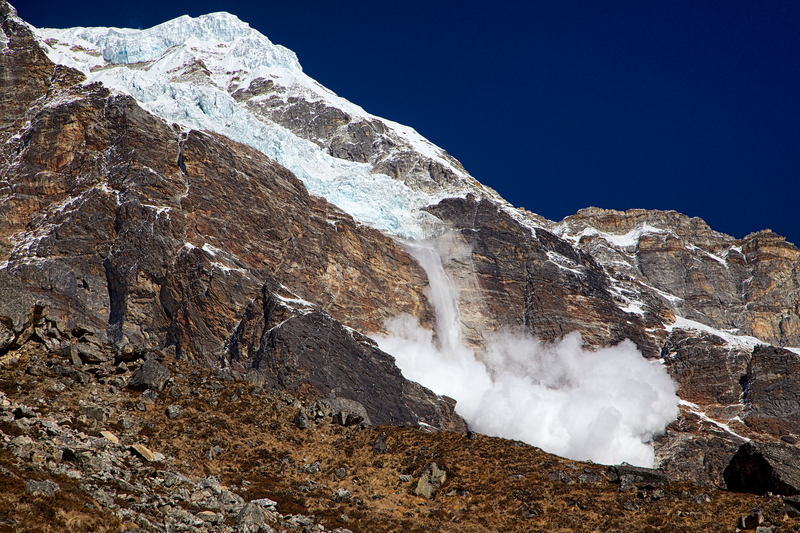 “Avalanche!”, yelled Karma with excitement. My eyes raced up to the right and spied the remains of a huge chunk of ice that broke off the hanging glacier and came crashing down to the rocks below. A gigantic cloud of frozen air and water billowed out for what seemed like minutes. Almost like clockwork, this hanging glacier had an avalanche both mornings we were in Tagnak. Thankfully, it was off in the distance. As we continued up the ridge, the trail continually switched back and forth on itself. The terrain was completely open, broken only by the occasional boulder. We all grouped up on an open section of the hillside to rest and shed a layer in the growing morning warmth. Becky, Andrew, Sonom, and Matt enjoy the view from our rest point. From our vantage, we had a good view of the rest of the climb. The hillside ascended steeply, covered with grass, until it narrowed to a snow-covered spine terminating in a higher ridge above us. The higher ridge was too steep to climb, so the juncture would be our stopping point. When we got to the top, we all broke into an impromptu photo shoot. Glen actually needed to get some product shots for a sponsor who sent some snacks with him. Everyone else must have just been practicing for the summit of Mera peak later in the trek. 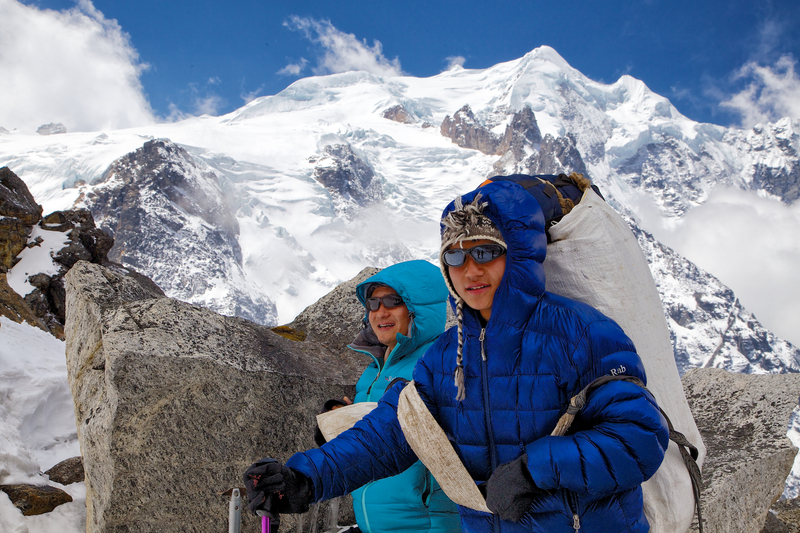 Chomba and Ang Rita strike their best pose standing high above Tagnak. As we made our way back down to Tagnak, I noted that I felt a little dizzy at this altitude. I did not have any head aches, nausea, or any other symptoms, so I did not think to hard about it. I mentioned it to Glen anyway, and he said to keep him in the loop if anything changed. The next day, Christen was feeling much better. We were all relieved that she would be able to continue on without too much discomfort. 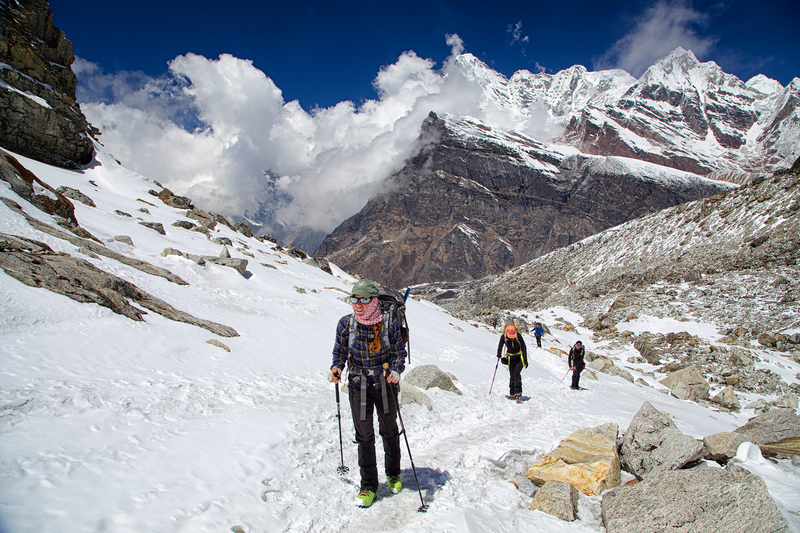 She was dealing with the demands of the trek with plenty of strength, grace, and just the right amount of stubbornness. Even though her clothes had not fully dried out from being washed, she still had a smile on her face as we wound our way up along the river towards Khare, the base camp for Mera peak. About 45 minutes up the trail, we started to notice little rock cairns everywhere, or small piles of rocks people leave to mark a trail. As we walked between the little monuments, steadily moving into thicker and thicker concentrations of them, we came up a small hill overlooking an emerald-green glacial lake. We paused to take in the other-worldly scene. High up the mountainside hung a huge sheet of ice, where a gigantic chunk broke off about 15 years ago, causing the tidal wave that eventually killed many people in the lowlands. 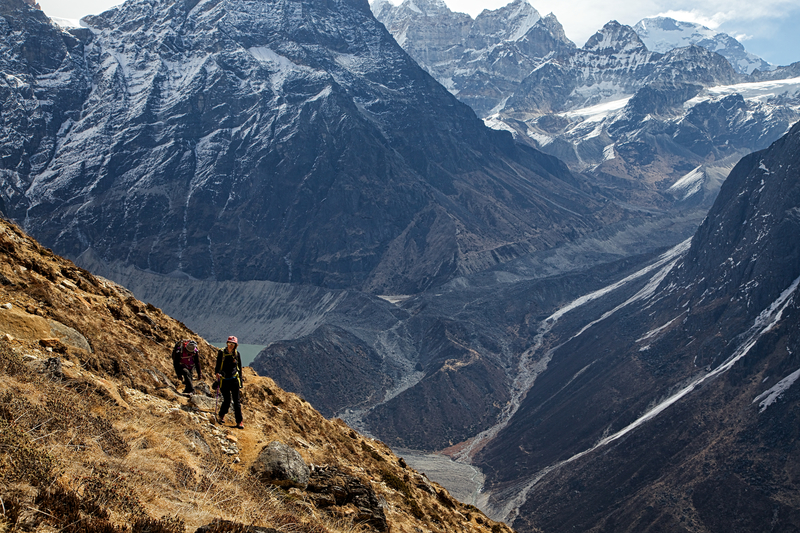 It was easy to see immediately why the local Sherpas paid so much respect to this place. Rock cairns mark this place as one of importance. This glacial lake overflowed 15 years ago when a huge chunk of ice fell into its waters, killing many people in the lowlands far below. As we neared Khare, the river valley opened up more broadly, and we could see the last big hill we would need to climb before reaching base camp. We were almost to what would be our destination for a few nights, and Christen’s goal for the trek. Christen and I walked around the corner of our lodge to where the rest of the group was just ordering lunch and assembling a bunch of climbing gear. As Matt attempted to haggle for some crampons without broken rivets piecing them together, Rose and Becky tried to find some boots that were not 4 sizes too big. In the end, we were all happily fed all sorts of different soups, mo-mo’s, mounds of noodles, and many varieties of teas. We all even had (mostly) the right gear. The 11th morning started fresh and white. This was quite the relief. Don’t get me wrong, Khare is in a mind blowingly beautiful place. Unfortunately, there is little to no vegetation, it is on a sometimes frozen, sometimes melting mountainside, and it is inhabited by almost 150 people at any given time during the trekking season. There was only one, (1), “uno”, toilet that people were willing to enter without a full body hazmat suit, and that one was also questionable. To say that the couple of inches of new, fresh, clean, white snow over night was welcome by all was to say that I was overjoyed when Ang Rita’s phone stopped spewing out Justin Bieber. I was. Andrew and Matt work their way up the snowy trail from Khare towards Mera La, our next acclimatization point at 17,500 ft.
During the first full day at Khare, we were to hike up to Mera La, a pass at 17,500 feet in order to acclimatize for the summit climb the next day. Along the way, I struggled to keep my footing. The trail was covered in only a thin layer of snow, too shallow for crampons. The hard plastic mountaineering boots I had rented were not the best fit. In addition, I was starting to feel the effects of mild altitude sickness. I explained to Glen that I was feeling light headed, dizzy, and had mild nausea. We stopped frequently, and drank water in small amounts. We also ate small amounts of food regularly, all to counter the effects of altitude. 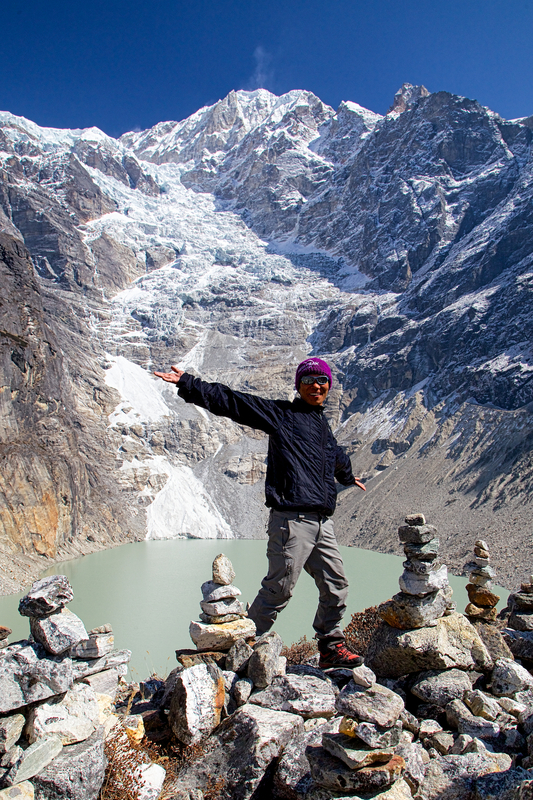 Dawa enjoys a break along the trail to Mera La. 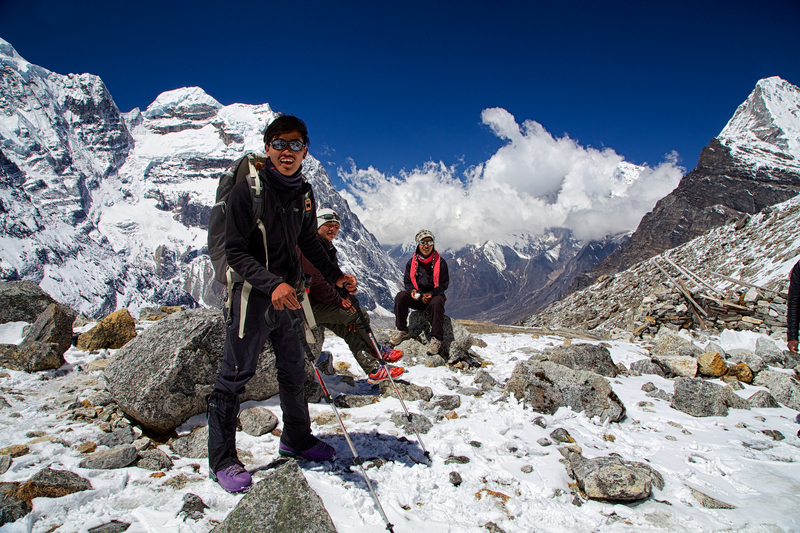 Sila, Surya, and Sagar carry supplies up to high camp, in advance of the trekking party. 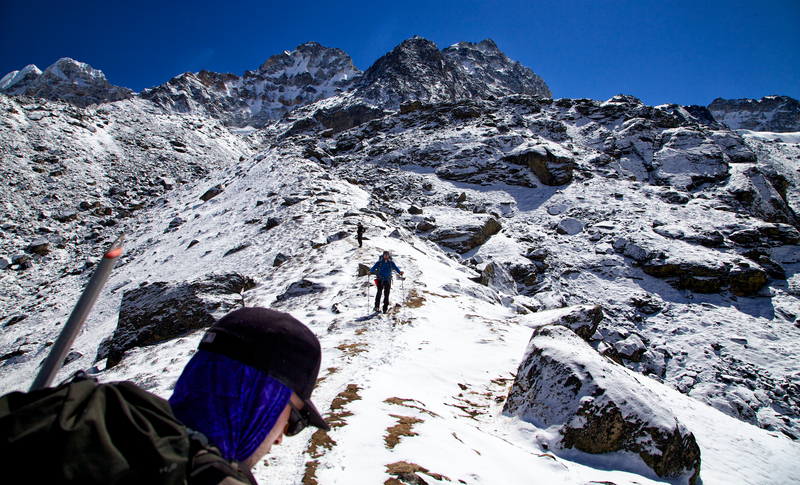 Becky leads the way from Khare up to Mera La. As we continued our ascent, the scenery kept getting better and better. That is, until the clouds came in. It had become a pattern that the mornings would be bright, clear, and blue, while the afternoons would be socked in by fast moving banks of clouds. 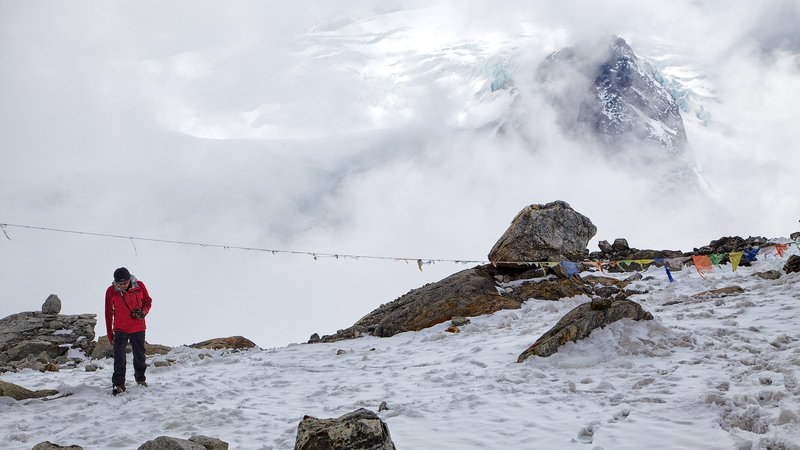 Sila and Surya enjoy the views of Mera Peak just as the clouds begin to move in. 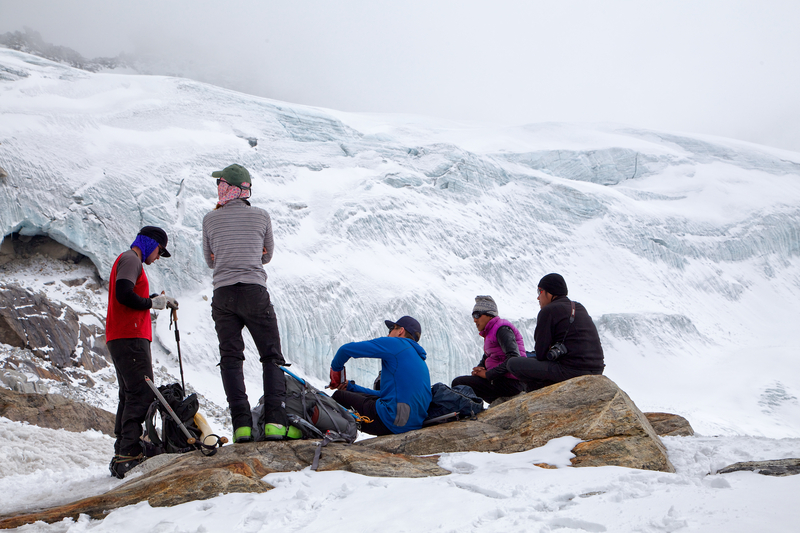 When we got to Mera La, Glen, Becky, and Rose all decided it was time to geek out and calibrate their altimeter watches. 17,500 feet was certainly the highest I ever had been in my life. I was starting to feel a bit better. I think the food and water helped quite a bit. Even better, we all decided to break out some more snacks now that we were at the turing around point for the day’s hiking. Karma and I looked around for some good photo ops, but the clouds came in so quickly that we did not get much time. Andrew, Becky, Matt, Ang Rita, and Karma rest at Mera La. Karma explores Mera La, looking for good photography opportunities. 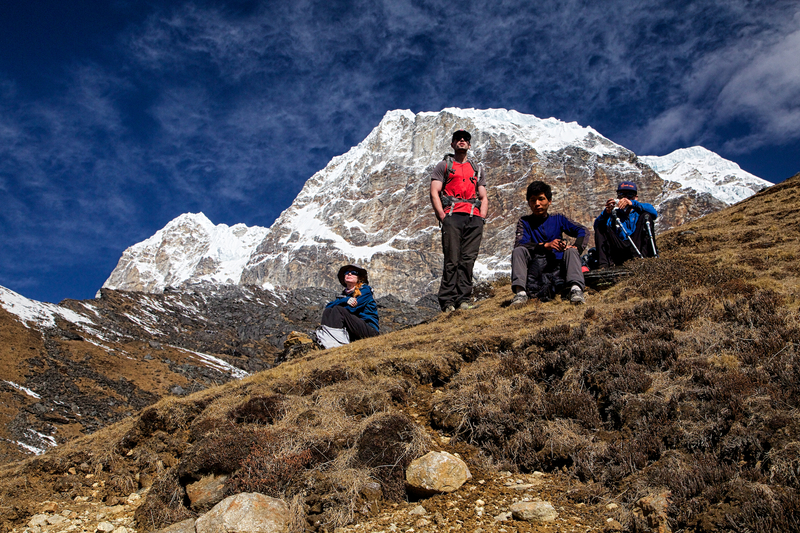 After returning to Khare, most of the group decided to get some rest for the afternoon. I opted to hang outside the lodge and take some time lapse photos. While chatting with Matt and Andrew outside, I again noticed that I was not feeling completely all there in the head. My legs felt great, I had plenty of energy, but my thoughts were very slow and I felt mildly dizzy all the time. As I was walking across the dining area outside the lodge, I tripped and banged my knee badly on some rocks. 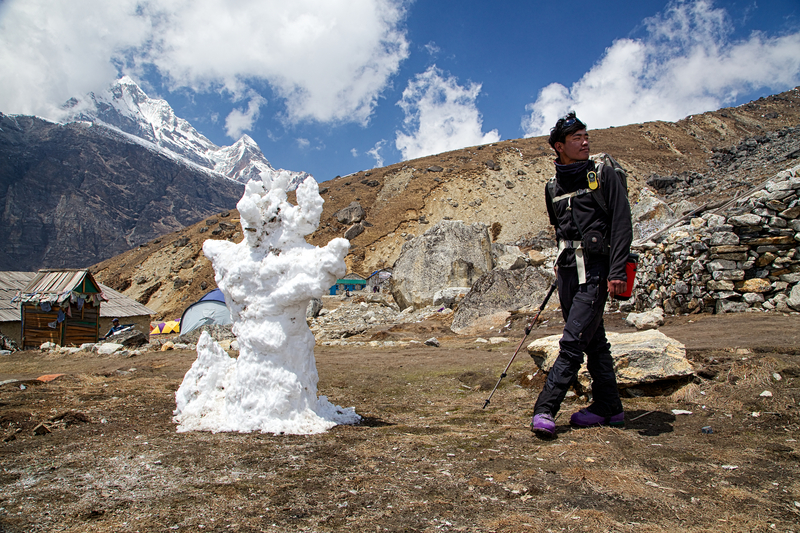 Dawa inspects the remains of a snow demon we came upon when returning from Mera La. Christen surely had a hand in its construction. I decided I should have a conversation with Christen, since she has known me for so long and she could give me a fair assessment on how “out of it” I was. I explained to her what was going on and that I was thinking of not climbing to the summit. She confided she was planning on suggesting that herself if I had not done come to my senses myself. She explained that I had been acting strangely since the acclimatization hike to Mera La at 17,500 ft. Gambling with altitude sickness was just not worth it. It is always great to have good friends whom you know have your back. The summit was not my mission, anyway. As it turned out, Karma, Matt, Andrew, and Becky all made it up to the summit for the rest of us two days later. Karma on the summit of Mera Peak. Photo courtesy of Matt Dreger.